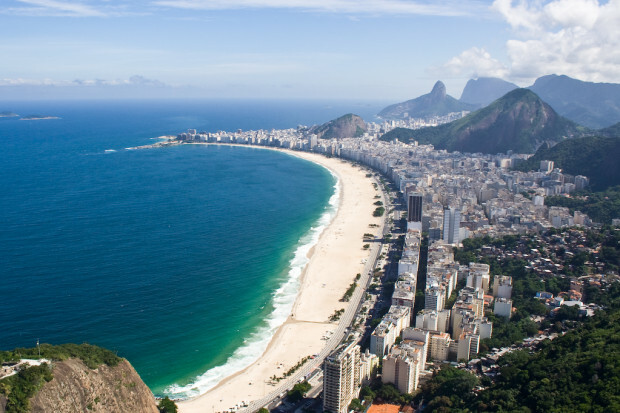 With the football World Cup in Brazil between now and the middle of June, fans from around the globe have descended on the South American country to experience the event, and no place has proved more popular than the famous Copacabana Beach in Rio de Janeiro. As well as the 12 host venues across the country, fans are also able to enjoy the action from one of a number of fan parks around the 12 host cities – the most popular being on Copacabana Beach. Nearly a million people watched Brazil open the tournament with a thrilling 3-1 victory over Croatia, creating one of the most colourful and exciting atmospheres in the history of the World Cup. Since then, though, Copacabana hasn’t been a place for just Brazilian fans to watch the games on the big screens, and visitors from all corners of the world have used the beach as their first option to experience the tournament. While the beach is a cocktail of world flags, ranging from England, Australia, Korea and Ghana, the most commonly seen flags are that of some people’s favourites for the tournament, Argentina. Tens of thousands of Argentines have made the relatively short journey north to follow their team in Brazil over the next month, and those fans were rewarded after seeing their team open up with a 2-1 victory over Bosnia. England fans always travel in numbers to support their team, and this World Cup in Brazil has been no different. While the inflated prices won’t go down well with the majority of England fans looking to enjoy a beer or Caipirinha as they watch the action, the picturesque surroundings will act as a decent consolation when their team make their inevitable early exit from the tournament over the next couple of weeks. This has already been an extremely exciting World Cup thus far, and we can’t wait to see how the rest of the tournament turns out! Posted in Brazil and tagged with brazil, football, rio, soccer, world cup. RSS 2.0 feed.